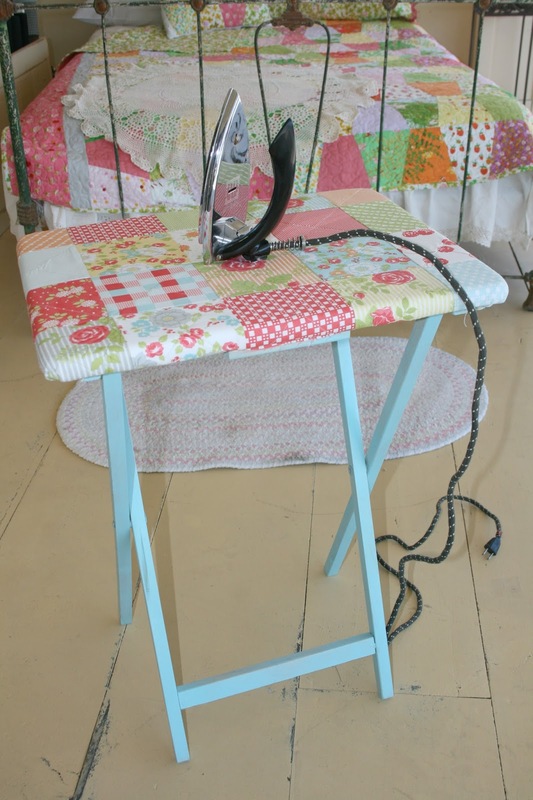 I finally made myself a mini ironing table. I wanted something I could put beside my sewing machine and not get up every time I needed to press a small seam. It was super easy to make. -if you want to spray paint your table do it first. I laid mine upside down on a piece of cardboard on my gravel driveway and sprayed a couple of coats on. No need to spray the top. -sew the squares together in each row and press the seams to one side. You can press the seams of the next row of squares in the opposite direction if you want your seams to nest and "lock". -baste your top and your Insulbright together using your preferred method of basting. I like a little 505 Spray and a few pins. 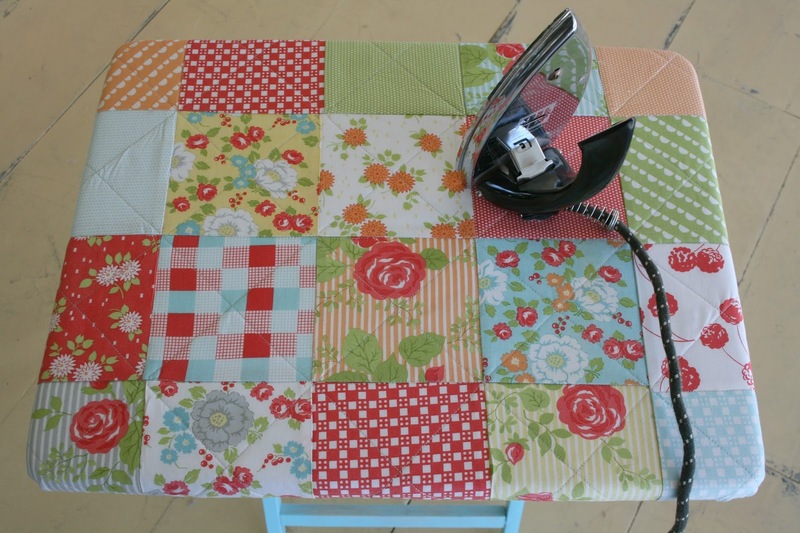 Lay your quilted top right side down on the ground and place your table on top. Line up the edges so all sides are even. -for the corners pull (gently) the corner diagonally and staple. Gather the fabric around the corner on each side and staple. -you could serge the edges first if a raw edge bothers you or trim the extra but I left it since I wouldn't be able to see it when the table was upright. Ta-Da! One little table that can fold up when you don't need it. It would also be good to take to classes or retreats. Speaking of retreats...you still have time to enter for a $100 gift certificate to either or shop or our Etsy shop. Click on this link to take you to our Name Our Retreat blog post for more details. I really like The Roost, because that is where I'd like to spend any quiet time I might find! 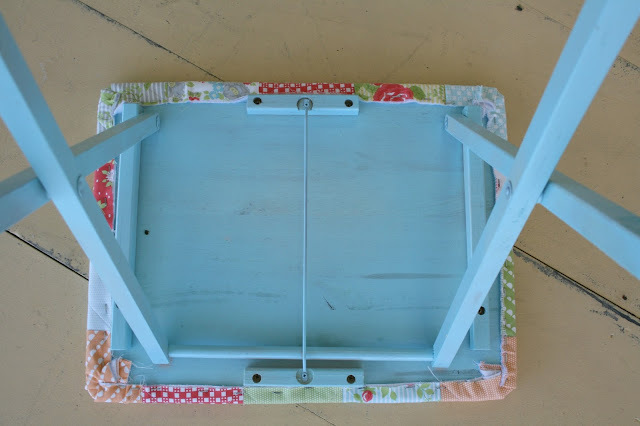 I bought a table to do this at the thrift store, I just need to get busy! Love your creation, the patchwork and the paint! Thank you! I just asked someone about how to do this and here you are! So cute, and I love that you painted the legs to match. Super cute sewing table. I need to do one of those some day soon. I have re-covered an ironing board or two, but one of these smaller ones would be handy. Good job! Clorissa, thanks so much. Happy Sewing! I do this table but I use elastic instead of staples. That way I can wash the cover! What a great idea....I like your iron. The quilt on the bed is a tumbler quilt. I used a die cutter to crank out the tumbler shapes but I am sure you can find a free template on the internet. I also added borders to the sides to widen the quilt. This is so darn adorable Tara that i would never want to fold it up and put it away! You don't need insulbrite. Use 4 sheets of aluminum foil. I'm going to make this! Which way do you place the insulbrite, shiny side on top or on bottom. #Contest - Name our New Retreat Center!